Crunch Tackled Two Goal Deficit but McNabb's First Won it in OT for Amerks · Let's Go Amerks! The Amerks win in overtime over the Syracuse Crunch on Sunday night had a little bit of everything, from wanting to ship the team out of the arena to jumping up and down celebrating a dramatic overtime win. It was a game that the team battled for and found a way to redeem themselves after a poor performance in Saturdays 5-2 loss to the Crunch. “There’s a lot of pride in the room in the players, they weren’t happy with the way things went Saturday night, had a nice win in Binghamton, were flat last night and wanted to come back and finish the weekend off,” Ron Rolston said. Five different players scored goals for the Amerks, nine players had assists during the game and they failed to product any points on the power play but made up for it with a short handed goal. There were some negative aspects to the way the Amerks played as well between some soft goals allowed and a soft defensive unit that’s giving up too many chances. 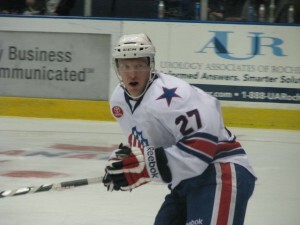 It didn’t take long for the Amerks to get on the scoreboard first, Mark Voakes took off after receiving a pass from Derek Whitmore and split the Syracuse Crunch defense at the top of the face off circle only 50 seconds into the game and beat Drouin-Deslauriers high glove side for his first of two goals on the night. Dan Sexton scored for the Crunch at 5:15 of the first to tie the game 1-1. Patrick Maroon sent a backhand pass from his end up to Sexton at center ice who went right between TJ Brennan and Drew Schiestel and beat David Leggio glove side as well. Colin Stuart sent a perfect pass through three Crunch players to Zack Kassian skating hard down the ice and after touching the puck in about five different ways with his stick he beat the Crunch goalie with a backhand. Bryan Rodney scored a power play goal to make it a 2-2 game at 12:48 of the first period. Jean-Francouis Jacques somehow passed the puck through Nick Crawford and TJ Brennan to Rodney who had all of Leggio’s stick side to pick where he wanted to put the puck in the net. Only two minutes into the second period the Amerks went up 3-2 thanks to some quick passes and easy tip in by Travis Turnbull. Jacob Lagace made the play happen by winning a battle for the puck against the back boards. Two Crunch players were going after him but he managed to push the puck down the boards to Phil Varone. Those two players went after Varone who sent a back hand pass back to Lagace who then pass it to Turnbull who tipped it into a wide open net. Mark Voakes looked like a wide receiver going long for his second goal of the game that put the Amerks up 4-2 while they were on a penalty kill. 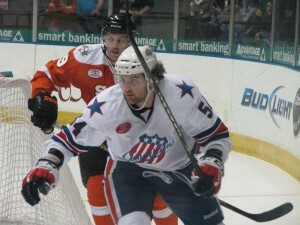 Brayden McNabb sent the puck out of the Amerks zone high in the air towards center ice to where Voakes was skating. Voakes reached in the air to try and catch the puck but it went off the tips of his glove and landed on the ice in front of him at which point he had a breakaway and put the puck in the top left corner. At this point the game went downhill in the second period. Nicolas Deschamps scored on a breakway at 8:27 of the second on the power play that got the Crunch within a goal. Less than two minutes later Mark Bell fired a slapshot from the top of the face off circle and Leggio made a partial save. The puck slowly slid through his pads and John Mitchell skated in and easily tapped it into the net to tie the game 4-4. 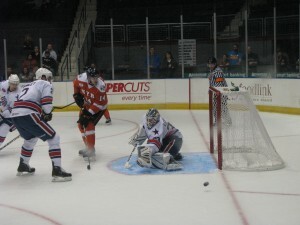 Patrick Maroon gave the Crunch a 5-4 lead at 12:32 of the second period knocking in an easy rebound. The Amerks had just tossed a two goal lead out the window, not something you want to ever do, especially on home ice. The team didn’t give up though and David Leggio held his composure, which a goalie is supposed to do. At that point some people would have pulled Leggio from the net but Ron Rolston held onto his faith in Leggio and kept him in net. “I liked that he was able to settle back in and not get rattled after giving up three in a row, that’s a good sign,” Rolston said talking about David Leggio. He also mentioned that the team was able to catch themselves and come back to help their goaltender out. In other words, the team didn’t lose faith in the game because of their goalie and cash it in. Finally at 17:56 of the third period Zack Kassian heard a familiar voice calling for the puck and passed it to Paul Szczechura who was all alone in front of the net and put the puck into the far side to tie the game 5-5. At 18:44 of the third period Marcus Foligno and Patrick Maroon bumped into each and shared some words. Maroon indicated to Foligno that he was ready to go and as Foligno dropped his gloves and started throwing punches Maroon turtled to draw the extra penalty and put the Crunch on the power play. That’s a move that many hockey purists can’t stand but it’s a veteran move on a rookie player late in a game and it worked. Thankfully the Amerks were able to kill off the penalty. In hockey it’s often a game of bounces where you either get a lucky bounce off of a goal post (or stick or skate or the boards) that benefits you or in some cases it benefits the other team. Luckily for the Amerks it was their night. A Crunch player took a shot that went off the post next to David Leggio and Jacob Lagace was in position to get a hold of it. Lagace passed the puck about half way down the ice to Szczechura who drew the Crunch goalie out of position and then put the puck perfectly onto Brayden McNabb’s stick for the game winner. “Brayden scored a lot of points in junior hockey, he’s got that ability, that finish and good vision,” Rolston said. 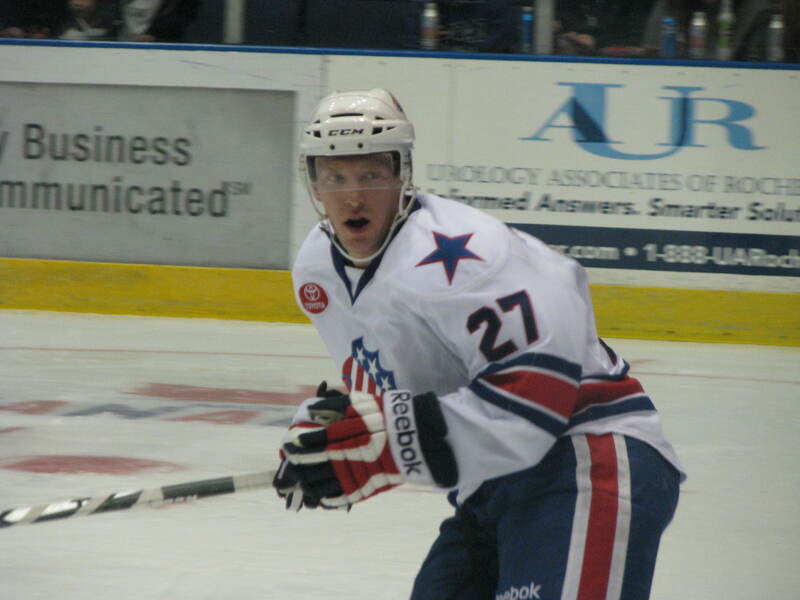 The Amerks have the day off on Monday before returning to practice on Tuesday at MCC.